Police have named a man who died after falling more than 300ft (91m) from a narrow mountain ridge in the Snowdonia National Park on Thursday. John Richard Norcross, 60, from Woodley near Stockport, was walking on Crib Goch with his son-in-law, who raised the alarm. 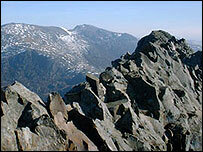 Police said an operation to rescue Mr Norcross, an experienced hill walker, was launched just after 1100 GMT. Mr Norcross was taken to Ysbyty Gwynedd in Bangor where he was pronounced dead. A 19-strong Llanberis mountain rescue team and an RAF rescue helicopter were involved in the search.